There are numerous video editing software in the market that get a lot of attention from the users, but these software fail to deliver a substantial result. There are other heavyweight software that that solve the purpose without making a loud noise as they perform at their best and provide an improvised output at the finish line. Flowblade is also such software that works in background delivering effective, efficient and above par performance as among the best video editing software for Linux. There are multiple factors which make Flowblade among the top software when it comes to video editing on Linux machines. 1. Lightweight This software is quite a lightweight application which makes it stand out as a better option over other video editing applications. Flowblade is a front-end for MLT and FFmpeg but leaving aside its complexity along with file sizes, this software is particularly designed for cutting videos. It has various features which are common among all the popular video editors. 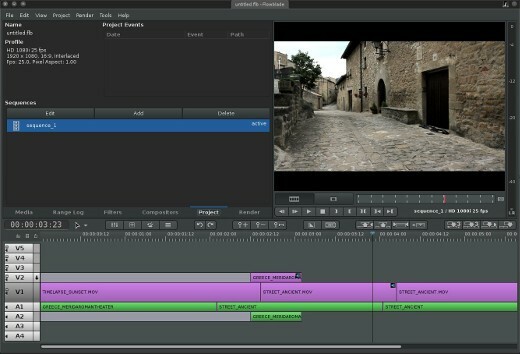 It also has video editing tasks, along with a set of special visual effects, basic audio related effects and exporting features. 2. Simplicity Most of the video editors are quite complex which makes you wonder how such an application which is a perfect fit with all its functionality in one particular row of buttons claims to be a sophisticated software. Flowblade’s prime functionality fit about ten buttons on the middle button bar of its interface. Other buttons are also present which can perform detailed work like zooming in or out, undo, redo, etc. All of its major functions comes with keyboard shortcuts, makes the editing process seamless once you get hold of these shortcuts. Even in case you haven’t ever used this software, you can edit hours of footage along with rough assembly without any time wastage making it feature among the simplest editors. 3. Video effects This software also benefits from a similar set of video effects that are present on almost every Linux based video editor- the Frei0r. This implies that you get a complete set of enhanced video effects which are available at your disposal along with the presence of superb front-end user interface that is provided by this software’s developers. These major factors make Flowblade a decent choice for those who are looking for video editing software or program for their Linux system. With its great ease of use, light-weight features and simplicity with seamless user interface makes it a good choice. In case you use this application, don’t forget to tell your experience to us. You can also mention your views and suggestion in the comment section below.